MIO-ECSDE amplifies efforts to put oceans’ priorities on the EU policy table! Today, MIO-ECSDE is excited to announce that it has joined the campaign which aims to put the oceans’ priorities firmly on the EU policy table! 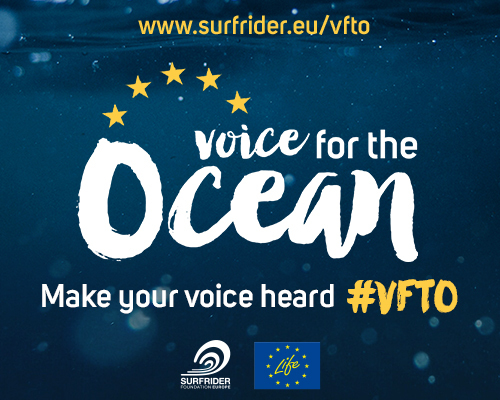 The Voice for the Ocean campaign, launched by Surfrider Foundation Europe, is an initiative with the goal to consult with ocean and coastal communities on the oceans-related policy agenda. Our seas and oceans face growing challenges from marine litter to climate change, affecting their health, resilience and the services they provide. 2018 and 2019 will be crucial for the future of our seas and oceans, as several European and international policy processes are expected to advance in order to achieve important environmental objectives, while also a new European Parliament and a Commission will be elected and appointed in 2019. The campaign, launched in May 2018 at the European Maritime Day, offers to all EU citizens the possibility to voice their priorities and concerns ahead of the European elections and position seas and oceans protection at the heart of the policy debates.